When your last game cover features your sport's greatest player ever, what do you do for an encore? If you're 2K Sports, you get three of the greatest players ever. 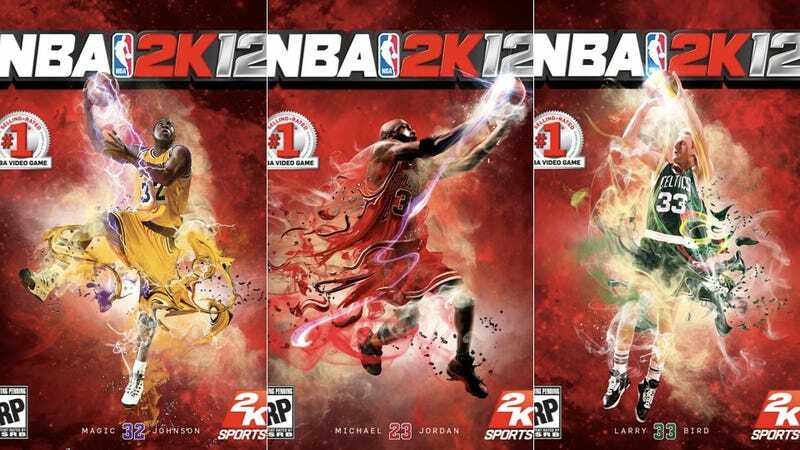 Michael Jordan will return as the cover star for NBA 2K12, and will be joined by Magic Johnson and Larry Bird. All three will receive their own cover, illustrated by the noted sports artist Adam Larson. "We wanted to bring Michael Jordan back, but even if we wanted to do something different, I don't think we could have." said Jason Argent, the 2K Sports vice president of marketing, noting the expectations created by featuring such a player. "So our go was bringing Michael Jordan back, but then, how do you take it up a notch?" For a generation of basketball fans, Larry, Magic and Michael are a holy trinity that defined the NBA over two decades, from Bird and Johnson's Celtics-Lakers rivalry of the 1980s to Jordan's championship dominance of the 1990s. Combined, the three won 15 NBA titles in a 19-year span. Deploying three legends to sell the game is also a smart move considering the current state of the league. Unable to reach a new collective bargaining agreement, the NBA's ownership has locked out the players, and league watchers are pessimistic that the season will begin on time. Labor disputes are tremendously off-putting to fans, so featuring a current player would at minimum be a reminder of that and the fact he can't be seen in real-life action. Further, the most logical choice among current players would have been someone like Dirk Nowitzki, who is a champion and future hall-of-famer but as a player simply cannot follow Jordan's act. Few can. At this time last year 2K Sports already faced questions of how it would or even could follow Jordan. So then Argent knows they'll have an even bigger task in an encore for these three. "Do we fear getting pushed into a corner? Not at all," Argent said. "In a way it's a better viewpoint. You're not looking at the game of basketball from one point in time, you're looking at the whole game of basketball and its history." Jordan's return to the cover raises the question of if "The Jordan Challenge," NBA 2K11's 10-game recreation of his most memorable performances ever, will also come back. Argent was deliberately vague. "We have a bunch more stuff to share later. What I would say is, we're not going to rest on that," Argent said. "That was such a great thing for us, a great hit for the fans, and we want to bring that to the next level, and bring the key feature set to the next level. The details are forthcoming, but suffice to say, fans will not be disappointed." A pre-order bonus could be a hint at what that might entail. Preorders will receive codes for two classic teams for use in the game, the 1990-1991 Golden State Warriors of Chris Mullin, Tim Hardaway and Mitch Richmond, and the 2000-2001 Sacramento Kings of Chris Webber, Vlade Divac and Jason Williams. NBA 2K11 featured more than a dozen historic teams, primarily for "The Jordan Challenge" but usable throughout the game. These Warriors and Kings teams both lost to the Lakers in the Western Conference semifinals. All three covers will be on shelves but, naturally, 2K Sports hopes that many fans will reserve a copy to ensure they pick up the one with their favorite player. "We wanted to do something big and unique and make a departure from the traditional brand look," Argent said of the covers' visual styles and subjects. "We listen to our fans and what they want, and I think they spoke last year with the response to Michael Jordan. The fans we talk to have steered us in this direction."